The way OSHA sees it is that you have general duty to do every other thing to keep employees safe. No matter what, you can never do enough under this theory. This is a hard one to fight and I am not sure that I have a great strategy to fight it yet. The next thing OSHA loves to do is say that your programs are ineffective. If anyone ever gets injured OSHA immediately throws in the towel and says your program doesn’t work. As if you can control for every conceivable damn thing that would happen including your employee’s downright stupidity, anger issues, and other outside-the-course-and-scope of employment action that they may take. Such as drinking alcohol before they come to work, bringing weapons to work, sexually harassing other employees, or doing what you trained them not to. It is usually at this point that we agree with OSHA and accept unwarranted penalties and let them walk away with our cash in hand. Let’s take a closer look at what OSHA is really saying and how we can fight this claim that our programs are ineffective. OSHA requires an IIPP which, here in California, has 8 elements. Here they are again. ME: How often are we supposed to inspect it? Everyday? OSHA: No, not every day, But all the time. Any reasonable person would understand that you cannot inspect something all-the-time and you do not need to inspect something every time you use it. Do you inspect your office chair before each time that you sit down? What about your keyboard? Your mouse? Do you even do these daily? The answer is no. And that is why OSHA only requires an annual inspection unless otherwise specified in their standards (think pre-trip inspections for vehicles and powered industrial trucks). Bottom line on inspections: do your inspections according to the schedule you set forth in your IIPP. Usually the single biggest element that OSHA will pick on as being ineffective is training. We all know that training cannot cover every situation (as stated above) so we are all bound to miss something. We can’t possibly cover everything. No one in their right mind would think that we could. And no one would ever try to because all they would do is train all year long. OSHA recognizes this in their standards as well. They only require you to cover certain elements which they explicitly state in their standards. Typically these are the minimum required elements that keep employees safe. Remember, OSHA operates on the principle of minimum requirements. The rest is fluff or better yet, “acts of diminishing returns.” You can only be so safe. And once you are, adding another layer will not keep you more safe. Quick mental picture – fall protection – adding a position device, a fall harness, lanyard, safety net and barricade is too much. One or two of those will do. While we can’t cover everything, I am not condoning a careless attitude or even an attitude that says it is okay to miss something. We should strive to cover as much as we can and make it as good as possible. But understand that according to OSHA, there is a minimum that is required to keep employees safe and that translates to being effective enough. OSHA realizes that employees will not follow the rules and people will make mistakes therefore you must have some form of correction that they will understand. That is discipline. And discipline is the final element that OSHA will look to. By stating that you must have discipline they are also stating that training is always effective. Because discipline is for a blatant act where an employee breaks the training and/or the rules. We must be careful to understand the difference between discipline and punishment. Discipline happens when you are aware of the rules and have sufficient knowledge on how to handle situations. When you break the rules or you are remiss in applying your knowledge you suffer the consequences of discipline. Punishment on the other hand is when you are unaware of the rules and/or have no training and you suffer corrective action or breaking the rules or taking an action when you have no knowledge that results in an error, mistake or injury. These definitions of punishment and discipline back up our argument that the training must be effective to discipline someone otherwise we would be taking corrective action against someone who didn’t know better (punishment). Here’ s the logic pattern you should use to fight the claim of an ineffective IIPP, understanding of course that you must have the other elements in your program and have executed them. OSHA recognizes that doing the minimum required will prevent employees from being injured. Doing more is a form of diminishing returns. By issuing a standard that is less than effective means that they are intentionally setting you up for failure and that is a form of entrapment. Read our post on OSHA entrapment. To prove that the training was ineffective OSHA must admit that their standard is not effective. OSHA’s requirement for discipline is an explicit statement that their standards are perfect and employees are not following the training or intentionally breaking the rules. Following the steps in the IIPP means that you executed the plan. Executing the plan means that the plan is functioning and in operation. The plan worked and functioned accordingly. Therefore you effectively implemented the 8 elements of the IIPP and the citation is bogus. 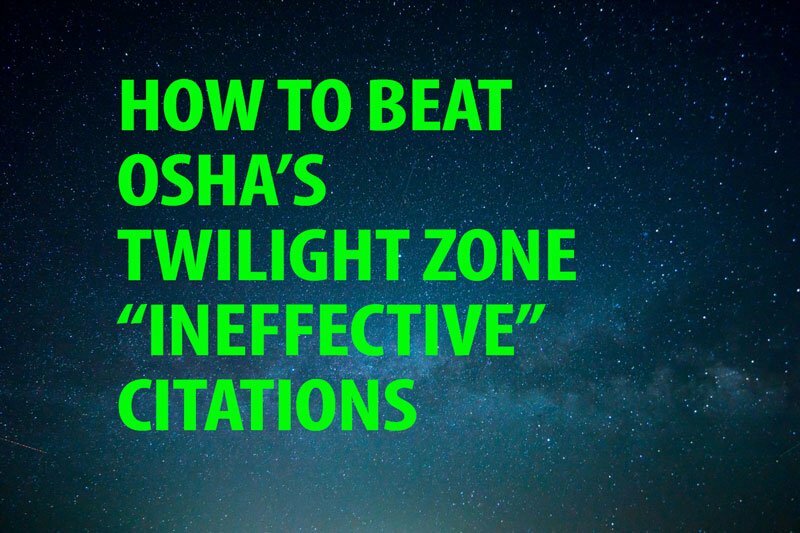 Let me know your thoughts or if you ever had to fight a similar citation. And if you have any helpful hints, feel free to share with other Risk Managers by leaving a comment below. Next Do door handles cause carpal tunnel? Pingback: Is Cal-OSHA guilty of entrapment?